As a security officer who has been the very satisfied owner of a Surefire 6PLED Defender flashlight for the last five years, I was intrigued by the new P2X Fury. I love my Defender, but excellent as it is, it’s still a single output flashlight rated at 80 lumens. As the duties of my job have expanded over the last few years, I often have occasion to use a flashlight with much lower intensity than the Defender’s 80 lumens, to be less disturbing to other people, to not spoil night vision as much, and because it will have much longer run time. However, much higher intensity available instantly is still essential, which the P2X Fury also has. Here are a few comparisons between the Defender and the Fury. The Defender has a tactical runtime (how long before light output falls below 50 lumens) of 2 hours, while the Fury is rated for 1.5 hours on its high setting. I love the idea of a dual output flashlight! You don’t really need to use the full brightness of the flashlight when you’re walking in the dark, you just need enough light to see where you’re walking so you don’t twist your ankle. Also, having a dim setting really helps your night vision. If you need to see something in the distance, you can light it up as clear as day. I tested this flashlight out on a 2 hour walk on some old railroad tracks through the forest. The trees block a lot of the ambient light from the moon and the stars, so it’s pretty dark. Most of the time I used the dim 15 lumen setting to see where I was going. Once in awhile, I would see some eyes on the trail up ahead of me. I was glad that I could click the switch and light up the animals with 500 lumens. I saw two whitetail deer in one hour. I think the low output setting keeps them from getting too spooked. I paid $123.78 for this on November 1st, 2012. I looked around for this type of flash light for a while. At work we get issued stinger rechargeable that I carry on my duty rig, but I wanted another pocket torch. Something small, light, and yet very powerful. I was looking at the ASP 35625 Triad LED Flashlight, but I went with the greater power output of the surefire. The ASP does recharge but I happen to get the batteries for free, so for me it was easier to go with. 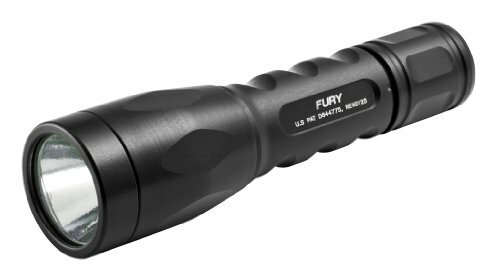 This flashlight is very rugged and worth the value!